We specialize in Dry Cleaning, Drapery Cleaning, Carpet Cleaning and Upholstery Cleaning. Please get in touch to learn about our services, including fireproofing and restoration services for smoke and water damage. When you want your high quality and delicate clothing to last, you need the services of the professional, experienced dry cleaners of Embassy Cleaners. Our accredited experts are masters in their craft who have years of knowledge and training regarding fabrics, chemicals, and proper cleaning techniques. Joseph Dieudonne is a National Cleaners’ Association Certified graduate of the International Fabricare Institute, and as our highly credentialed Cleaner/Spotter, he has 27+ years of experience cleaning, protecting, and preserving clothing. Joseph also earned his certification from America’s Best Cleaners Wet-Cleaning Workshop at Edison Customer Technology Application Center (CTAC), a prestigious institute in Irwindale, CA. 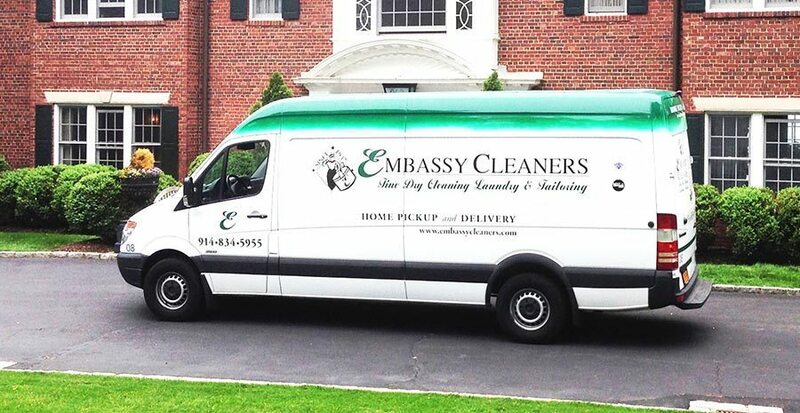 For your convenience, Embassy Cleaners offers courteous Dry Cleaning Pickup and Delivery. We have the largest and most experienced Dry Cleaning Pickup and Delivery services in Westchester County. Our dedicated delivery drivers visit our clients 1-2 times per week. Buying clothing off the rack and expecting it to fit you perfectly can lead to disappointment. Fortunately, professional custom tailoring from Embassy Cleaners helps all your clothes, from business attire to casual garments, fit you perfectly, flatter your appearance, and earn the positive attention you deserve. With custom tailoring, you can bring all those ill-fitting clothes out from the back of your closet and finally make them useful additions to your wardrobe. Tailoring helps all types of clothing fit your specific proportions comfortably and gives you that edge that draws the eye. The Embassy Cleaners tailors understand various fabric types, cuts, and fit, and provide helpful insight regarding suits, skirts, dresses, shirts, and pants that will flatter your physique. Having clothing that fits you well can improve your confidence, as you no longer hide beneath ill-fitting garments. Make your wardrobe perfect for your body-type with the help of one of our highly-experienced tailors. To keep your New York carpets and rugs in great condition, you need professional rug and carpet cleaning from Embassy Cleaners. Without regular, professional cleaning, the dirt and grime tracked through your home can make carpets and rugs appear soiled and damage their fibers. Periodic rug and carpet cleaning by our experts at Embassy Cleaners adds years to and preserves the beauty of your home’s flooring. It even helps reduce allergens and germs. Professional cleaning of rugs and carpets keeps them in the best possible condition, extends their life, and maintains their beauty. At Embassy Cleaners, we use the hot water extraction method for a thorough clean followed by lowering the pH with a neutralizing solution. Thoroughly drying the carpets and rugs with large fans prevents mold or mildew. We remove any remaining spots with a special cleaner. Our professional technicians ensure that your rugs and carpets look and feel like new and last for years. Although you may not think about cleaning your upholstery until it gets stained or starts to look soiled, having professional upholstery cleaning done regularly can help extend the life of your furniture while returning them to their original beauty. For small stains, spot treatment may seem like enough, but without regular cleaning, dirt, allergens, and bacteria can accumulate in the material and compromise air quality inside your home, causing issues for allergy sufferers. With professional upholstery cleaning, your home remains clean, comfortable, and looking its best. Our New York professional, experienced technicians know how to clean all types of upholstered furniture effectively and safely. We receive recommendations from designers and retailers including Ethan Allen™ and Crate and Barrel™. At Embassy Cleaners, we have decades of experience cleaning fine furniture, and our solvent-based cleaning solutions with steam extraction carefully and effectively clean all your upholstery fabrics, including luxury materials like silk and chintz. The draperies and window treatments in your New York home provide shade, privacy, interior design enhancement, and energy savings. As you open and close them daily, you may not realize how dirty they are because they appear clean. However, window treatments can be home to allergens, dust, mold, and mildew. A majority of high-quality draperies and window treatments require professional cleaning. Embassy Cleaners provides experienced off-site or in-home window treatment cleaning that includes takedown and re-hanging to make life easier while keeping your home beautiful. Window treatments represent a significant investment and having them professionally cleaned with the proper methods, consideration for embellishments, and caution to avoid shrinking ensures that they remain beautiful. Embassy Cleaners provides high-quality, experienced professional drapery cleaning service on your schedule. If your home suffers smoke or water damage, it’s important to act quickly and seek a cleaning and restoration service to avoid permanent damage. With Embassy Cleaners smoke and water damage restoration services in New York, your fabrics can return to their pre-loss condition. Clothing, window treatments, and furnishings can be challenging to clean following smoke damage. Professional cleaning can help reverse discoloration, black marks and odor created from smoke and soot on fabrics. Embassy Cleaners has an innovative ozone facility and smoke-removal technologies that neutralize smoke odors prior to cleaning and deodorization. Water damage has many causes and usually happens unexpectedly, leaving you unprepared for the extent of the damage. Proper drying and water removal must happen quickly and prior to treating furnishings, window treatments or clothing. Embassy Cleaners can clean your water-damaged items effectively, promptly and safely thanks to our expert training and experience caring for various materials.